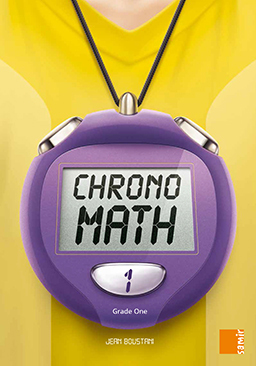 Inspired by the most recent pedagogical concepts for mathematics teaching, and conceived for the reinforcement of previously acquired mathematical concepts in the Arabic language, Chronomath, animated by two young characters, Salma and Khalil, aims at a more profound understanding of English mathematical key terms, fixing notions and a consistent formation of mathematical reasoning. The book divides the academic year into four branches with twelve lessons each. The intention is to cover two lessons per week. Each lesson consists of one page and always starts with a situation-problem that helps the student reflect, followed by a set of exercises that allows a better acquisition of the acquired notions or techniques. The rest of the exercises ensure a fixing of the acquired concepts. Consequently, it is a progressive enrichment of the students’ “know” and their “know how” aiming towards the development of their capacities and competences. The two evaluation pages, titled I test myself, located at the end of each branch, explicitly explain the targeted objectives, thus allowing to know what the student has acquired and to channel the concepts that need to be revisited in case they were missed. The reinforcement page, titled One Step Forward, serves to further consolidate the acquired notions and techniques. The last page of the book allows the student to sum up the results of all the I test myself pages and file the yearly report.